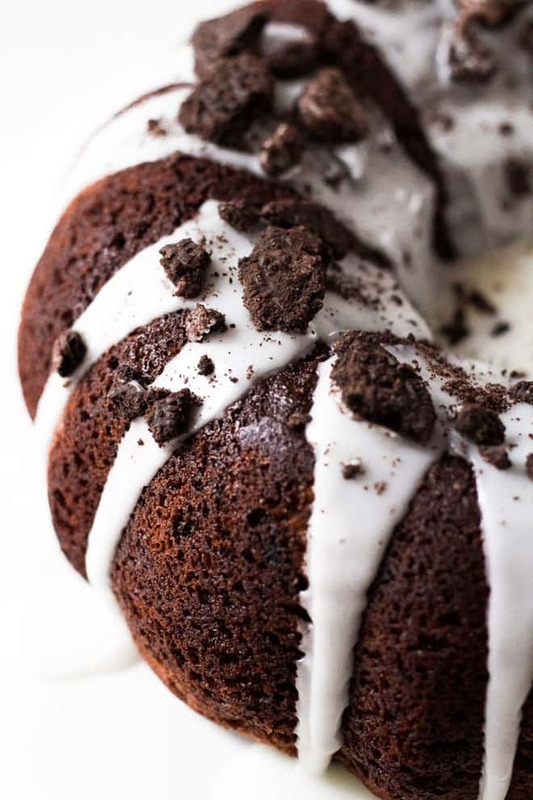 Chocolate Oreo Bundt Cake – Soft and moist chocolate bundt cake stuffed with Oreo chunks, iced and topped with even more Oreos! This cake is a chocolate and Oreo lover’s dream. 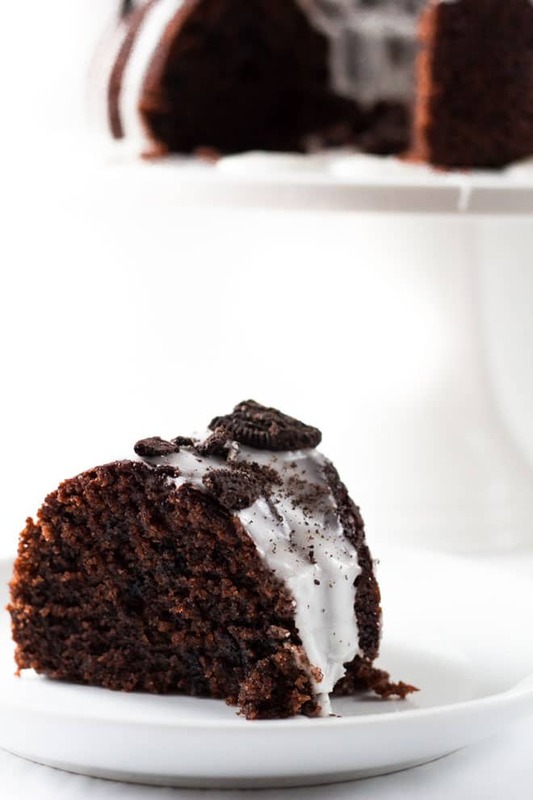 The sponge is so moist and melt-in-your-mouth, and the crushed Oreos add a delicious crunch. TIP: If you can’t get hold of buttermilk, make your own! Just add 1 tablespoon of white vinegar to a measuring jug, then add 240ml of milk. Leave for 5 minutes, then it’s ready to use! Preheat the oven to 350F/176C. Spray a 10" bundt pan and dust with cocoa powder, then set aside. In a large bowl, whisk together the flour, baking soda, cocoa powder, and salt. Set aside. Using a handheld or stand mixer fitted with the paddle attachment, beat the butter on high speed until smooth and creamy. Add the sugar and beat on high speed until well combined. Add the oil, eggs, and vanilla and beat until combined. With the mixer on low speed, add the dry ingredients in three additions alternating with the buttermilk, beginning and ending with the dry ingredients. Fold in the Oreo chunks. 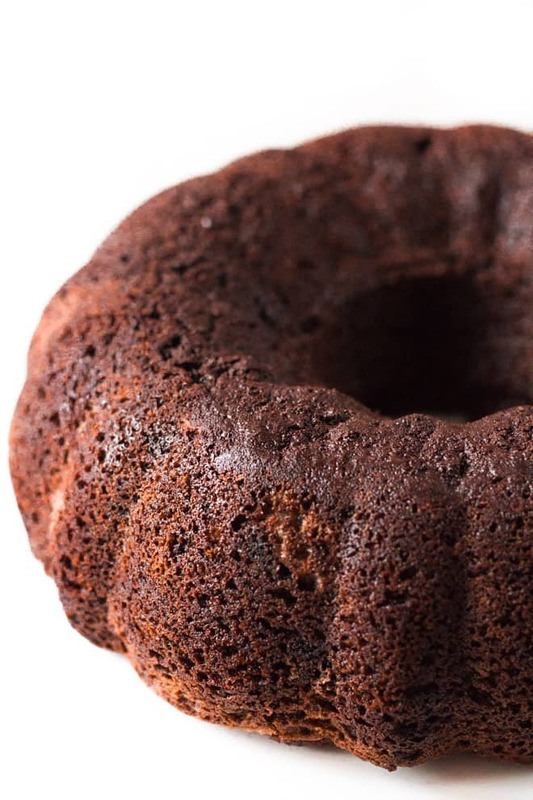 Pour the batter into the prepared bundt pan and bake for 50 - 55 minutes or until a toothpick inserted into the centre comes out clean with moist crumbs. Let the cake cool for 20 minutes in the pan on a wire rack before removing. Leave to cool completely before frosting. Whisk together the icing sugar, milk, and vanilla until smooth. Add more milk if too thick. 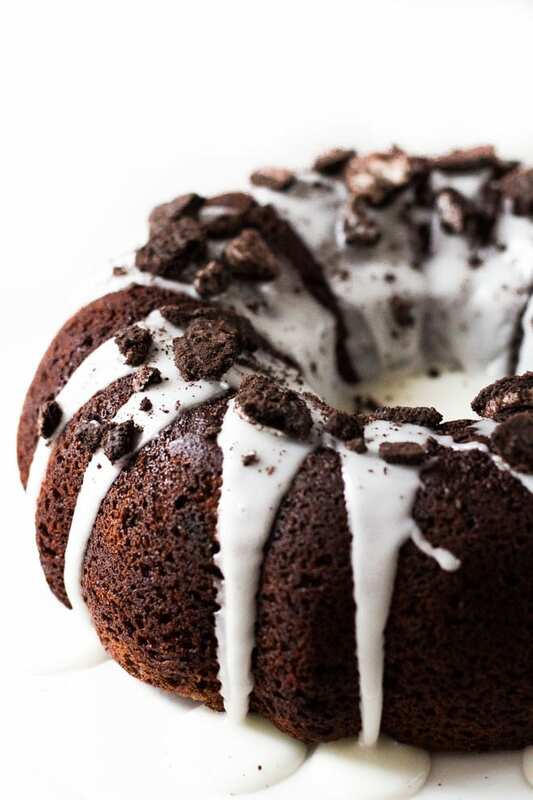 Pour over the bundt cake, and sprinkle with Oreo chunks. TIP: If you can't get hold of buttermilk, add 1 tablespoon of white vinegar into a measuring jug, then pour in the milk. Leave for 5 minutes, then it's ready to use! Yum! My other half loves Oreos, so I might save this to make for his birthday! Can I make cake ahead of time? 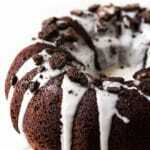 Great minds think alike because I posted a bundt recipe on my blog today too! Yours looks delish! My husband is an Oreo addict, so he will freak over this cake! Can’t wait to make it for him! Cheers, doll! Oh my goodness, this bundt cake is gorgeous, Marsha! Love the texture! Chocolate and Oreos are the ultimate decadent combo! After reading the comments I see my SO isn’t the only one that loves oreos. I definitely have to make this cake. Thank-you for the recipe! Oreo heaven for sure – fabulous recipe Marsha. Well done. You are killing me this looks so good! Don’t you know that January is national diet month :). Love the flavor combo! It definitely shouldn’t overflow, but it will rise quite a bit. I’m hub’s a fan of oreos while I love chocolate cake to death. He can eat the oreo chunks while I the cake. Lol. Thanks, Tania! Happy New Year! This is such a beautiful bundt cake! I am definitely craving this right now. And that glaze looks heavenly! 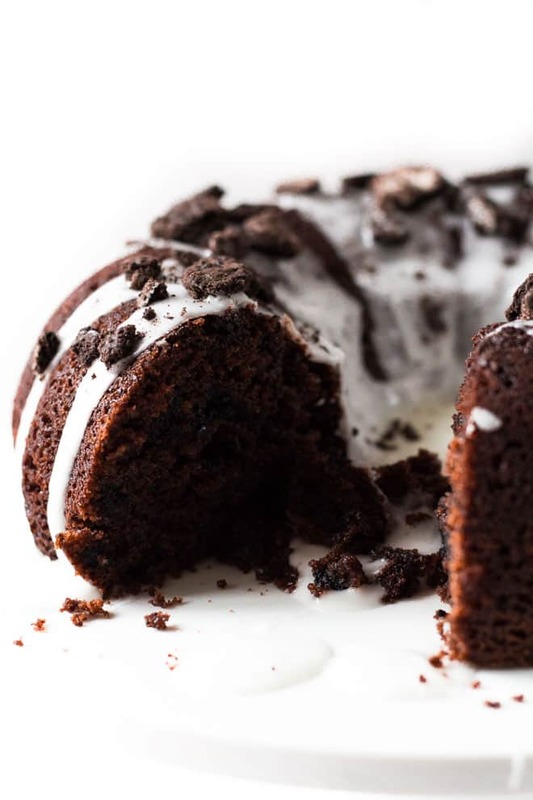 I love your Oreo bundt, it is great to find a bundt recipe in metric measurements too (I’m in England) as most seem to be in cups which we don’t use over here. Would love a slice please! You had me at chocolate! Looks amazingly delicious! Thanks for sharing! Pinning this and making this!! I need this in my life 🙂 Oreos make the world go ’round in my opinion 🙂 Thanks for sharing!! My two kids will want to dive into that cake if they can. They love Oreos !!!! 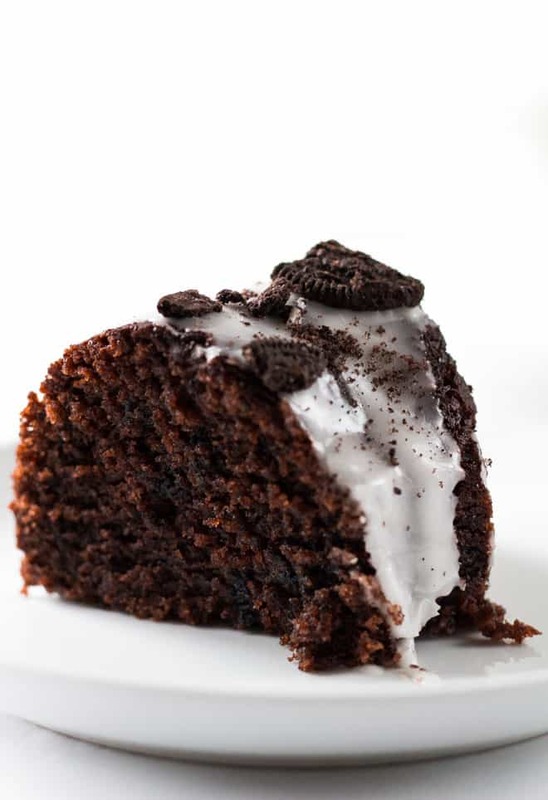 My children love oreos and this cake looks so moist and yummy, I would love to make it! Thanks, Adina! I hope you enjoy! Oreos have become a staple in some of my recipes. Can’t go wrong with it! This recipe is already putting me in a nice food coma. But enough about buttermilk. Can we talk about this cake? It is so pretty. You can tell from the photos just how moist it truly is. And that glaze. . .it looks so stunning up against the rich, chocolatey cake. . This cake looks amazing! Putting all the ingredients on my list!